The guys at Film Riot have some cause to celebrate today. It seems that one of their videos has passed the three million view mark! Specifically, it’s the one titled “Learn FX Secrets From Exorcist and “From Hell” In which they show how to do a throat cutting effect that looks real enough that you’d expect the actor to have to buy a gallon or two of acne scar treatment to heal a really incredibly nasty and very very real looking wound. They also show how to do an extremely realistic “Exorcist” style projectile vomiting effect without actually having your actors blow chunks for real. In fact, here’s the episode itself which has 3,053,952 views as I write this. Ever wanted to do something like come up with the best in the world way to gross out your sisters? C’mon guys, admit it, grossing out your younger sisters is one of the finer things in life. In this video Backyard FX shows how to easily make passable blood, snot, puke & poop for use in video productions. Just from looking at the video I’d say that if you were careful with the camera angles and editing you could do a lot of truly disgusting things with this. Plan it right and the girls will never know what hit them! I was watching a video yesterday that included a unique kind of transporter accident in the story. Two people were beamed up but before they could be rematerialized, the transporter circuits suffered severe damage. When folks had the chance to do some repairs they tried rematerializing the patterns that were held in it’s buffer. Unfortunately, only one person appeared. There was still one pattern in the buffer but the body that had appeared had the minds of both people in it. This lead to an interesting series of conflicts that was made worse (and funnier) by the fact that one was an attractive, active woman and the other was a geek whose only good feature was the fact that he’s smarter than anyone else around… and knows it. They eventually managed to get things sorted out and back into their own bodies but it got me to thinking. It’s been a LONG time since I’ve seen the very first movie that involved a transporter accident … The Fly. And I’m not talking about the 1980’s remake either. I’m talking about the 1958 original with Vincent Price and the sequels that came after it. What’s really cool is that I found them on sale in a single set!! 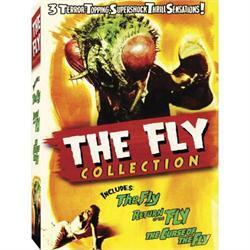 The Fly Collection is a set that has all three of the original classic science fiction slash horror movies in one place. Say what you will about visual effects and film quality being less than what can be done now but on the other hand, they told a VERY intense story that scared the crap outta people without having to resort to filling the screen with gallons of blood or mountains of gore. I think there was, in many ways, more art to telling stories in a visual medium then than there is now. Don’t get me wrong, I love CGI and visual effects and I think they can be used in fantastic ways. However at the same time you can do a heck of a lot with a good story and a director that knows how to lead the audience where he wants them to go. I’ve been trying to learn how to use Blender’s fluid animation capability in hopes that I can use it to create a passable “Kawoosh” with it.